Shining the light on our unique community of inventive, original and extraordinary musicians, performers, visual artists, custom designers, culinary artisans and creative service professionals who infuse fundraisers, weddings, events and celebrations of all kinds with artful atmosphere and ambiance, style and panache, heart and soul and joie de vivre. 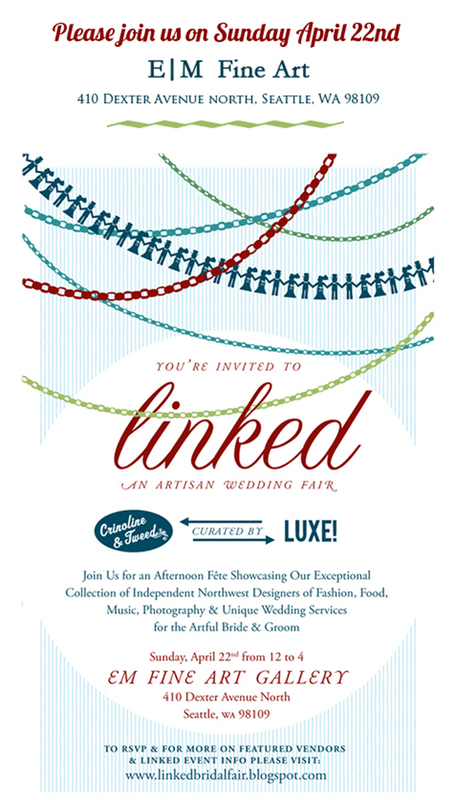 Our afternoon wedding showcase, Linked, is just around the corner and I'm extremely excited about the talented musicians we will be showcasing. 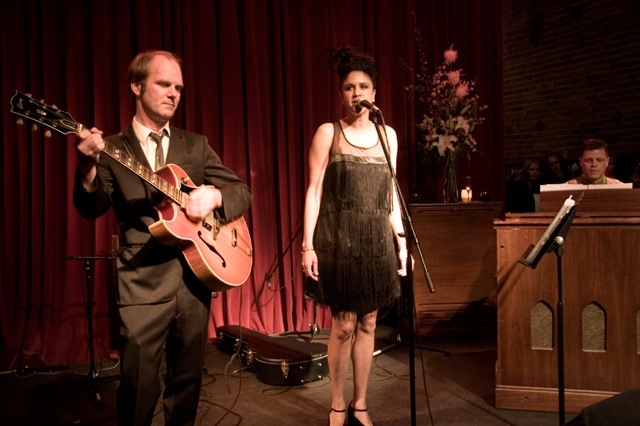 Imagine gorgeous French music and vintage acoustic jazz--music just perfect for a sophisticated, swinging cocktail hour at your wedding. 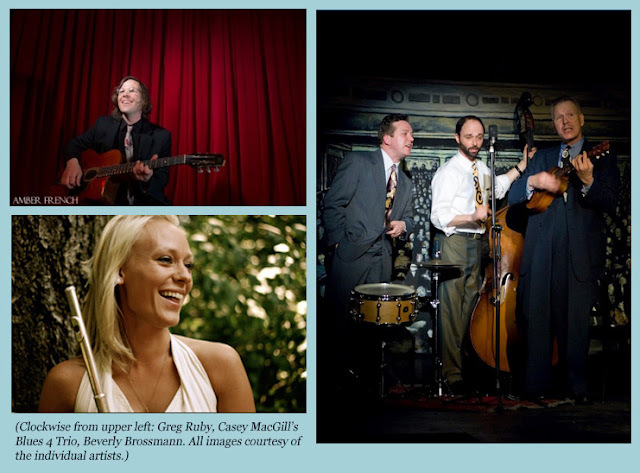 From a sophisticated guitar & violin duo for the ceremony, to a vintage jazz trio for the cocktail hour, to a swing dance band for the reception, Greg Ruby is able to assemble an ensemble that fits the mood and ambiance of your wedding. Wonderfully custom and gorgeous music for your celebration, Greg's music is topnotch. Don't miss him playing at Linked! 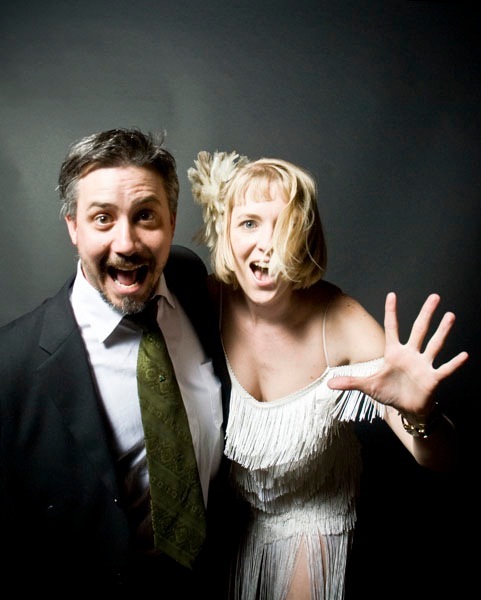 Seattle group, Miles & Karina, play smart, quirky, thoughtful and spirited music for your wedding. Perfect for the pre-ceremony, ceremony, cocktail and reception, their joyful sound will help make your dream celebration a reality. Versatility and excellence with style! Accomplished flutist Beverly Brossmann's unique, beautiful and innovative music is perfect for ceremonies, cocktail hours and celebrations of all kinds. 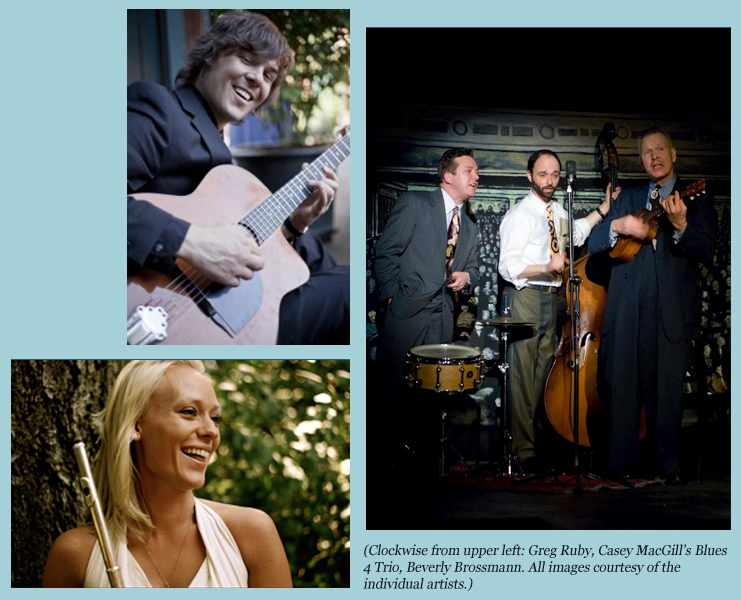 This Sunday at Linked, Beverly will be showing off a little Bossa Nova and intriguing accompaniments. Casey and Matt from the Blue 4 Trio will be playing as a duo, busting out a couple of sets this Sunday. These guys are pure music gold, charismatic and super fun! 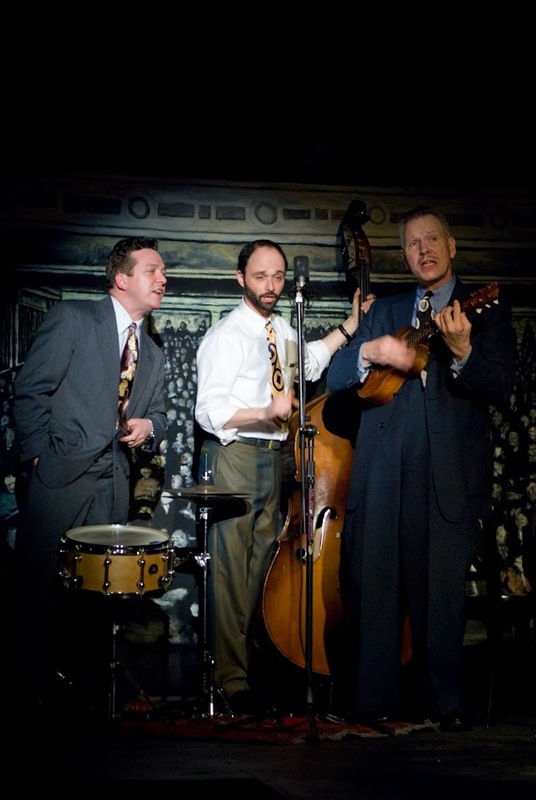 Casey MacGill's Blue 4 Trio: New CD "Barrelhouse" available now! These are just a few of the talented musicians that will be performing at Linked. And don't forget, space is filling up quickly for the event. If you haven't yet RSVP'd, please do so now at crinolineandtweed@gmail.com. Linked is an artful afternoon bridal soiree designed for creative, stylish couples looking for unusual, unique and exceptional wedding services, fine music, custion fashions and delicious Northwest fare that transcend the ordinary. 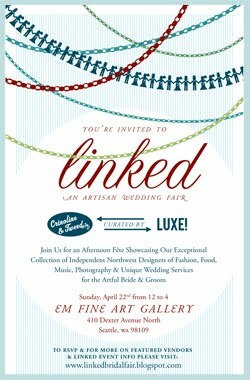 Linked is curated by event designers Tes de Luna and Sarah Furstenburg of Crinoline & Tweed and myself, Annette Lefebvre, of LUXE! Productions & Wedding Design. This amazing event is an opportunity to feature the artisans we work with, know well and love, and it could not have happened without the help of our dear friends and co-sponsors, Marigold & Mint and Vintage Ambiance. 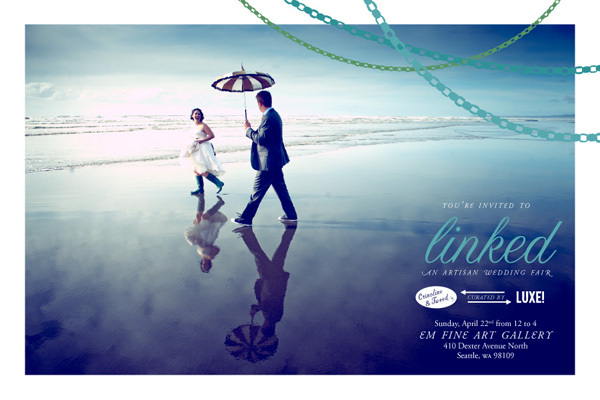 Linked will be hosted at the exceptional art gallery and event space EM Fine Art. A post industrial urban oasis located in the South Lake Union neighborhood of Seattle. Stay tuned for a list of participating artisans. Please RSVP soon as space is limited. We hope to see you at our event! 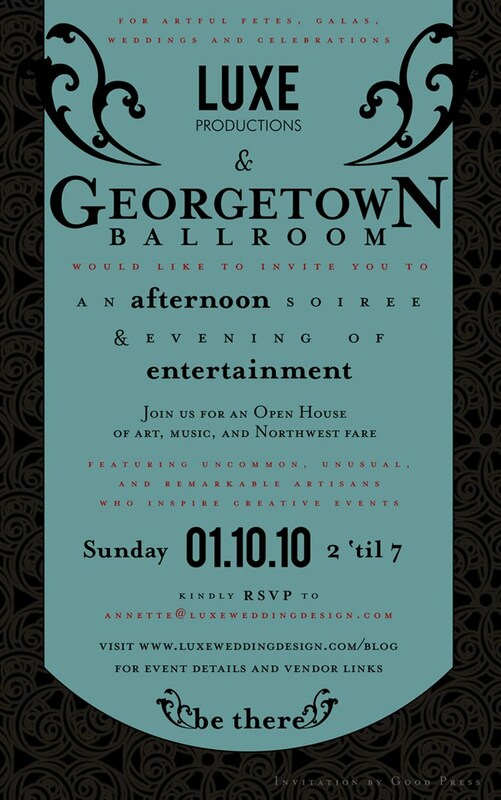 Luxe Productions and the Georgetown Ballroom are kicking off the new year in style on Sunday, January 10th with an invitation only festive gala for our Northwest event community of planners, non-profit organizers, wedding industry peeps, couples getting married and anyone interested in throwing a party that transcends the ordinary. The charming and beguiling dual masters of ceremonies and wedding celebrants, Pastor Kaleb Kerr and Kevin Joyce! Outstandingly distinctive Northwest fare by noteworthy Gourmondo Catering, Truly Events, Ciao Thyme Catering, Azafron Paella Catering and Veraci Pizza to name but a delectable few! Sublime desserts by artisan pastry chef Ruth-Anne Ford, beloved local baker Suzanne Rosellini of Rosellini Sweets and handcrafted chocolates by chocolatier Ivy Chan of Cocoa Chai Chocolates. The knowledgeable and highly trained sommeliers of Élevage Wine presenting their wedding program, notable beverage and wine consultation services, not to mention delicious wine tastings. The phenomenal custom invitation designs of Bremelo Press’s Lynda Sherman, Good Press’s Shawna Kitzman and Truly Events’ Jodi Davis. Meet all of the designers and witness their fantastical talents, elegant creations and incomparable styles. Unmatched, memorable and modern event photography by Adam Smith and Lifework Images. Gorgeous, innovative floral inspirations by the highly regarded Miki Maxey of Miki’s Flowers. 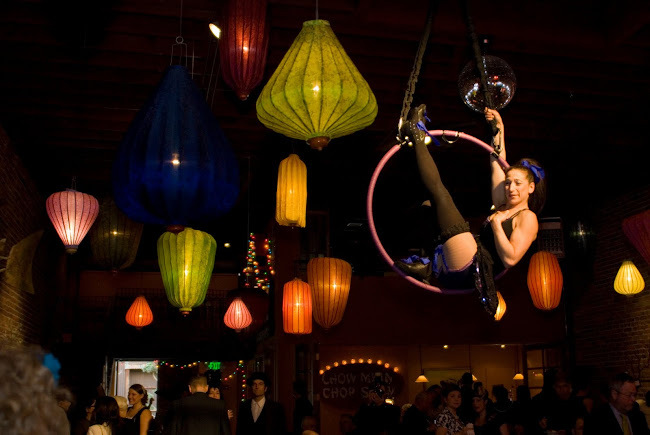 The illuminating expertise and brilliance of Kathy Justin’s event lighting with KMJ Design. Vintage inspired decorations & favors by the cool retro lovelies at Party Partners. A bejeweled table display from the boutique Essenza of well crafted, rare and refined wedding rings that enchant, captivate and enthrall created by fine artists Jamie Joseph and Francesca Lacagnina and specialized perfumes for the bride and wedding party. Unprecedented valet service and transportation by Butler Valet. Unique wedding planning, coordination, celebration design & ceremony consulting by (yours truly!) Luxe Wedding Design. Topnotch full audio-visual service by Blue Danube Productions. Unrivaled event creation, customized music, performances, choreography, auctioneer services and interactive characters by Enjoy Productions. The super fabulous alternative DJ's, Dug! Spinning vinyl gems and specializing in early sixties soul, jazz, rare funk, world, swing, hip-hop and other strange and wonderful genres galore! Revolving sets of eclectic and unparalleled musical stylings by Lushy, The Blue 4 Trio, The MoonSpinners, Erin Jorgensen and surprise guests. 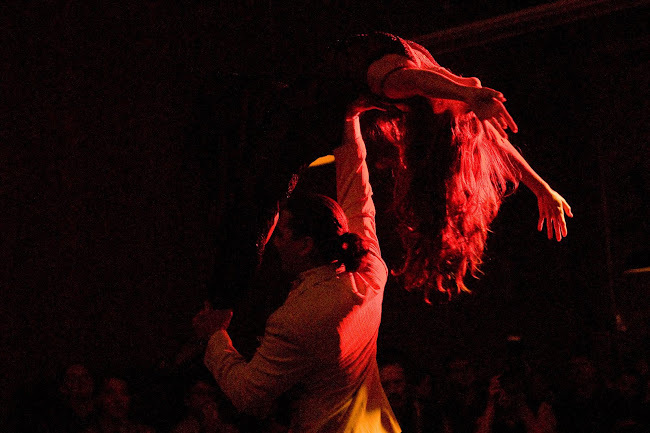 Unbelievably skilled ballroom, hip-hop and tango dancers performing to the live bands and recorded music. All of these artisans and services brought together in one special venue and oh so much more! For inquiries or to RSVP please click on the invitation. We hope to see you on Sunday, 01.10.10! Don't miss Joe Ross on Sunday, 01.10.10. The fantastic singer, musician, and swing dancer extraordinaire! Joe will be performing a few dance numbers to Casey and the Blue 4 boys. 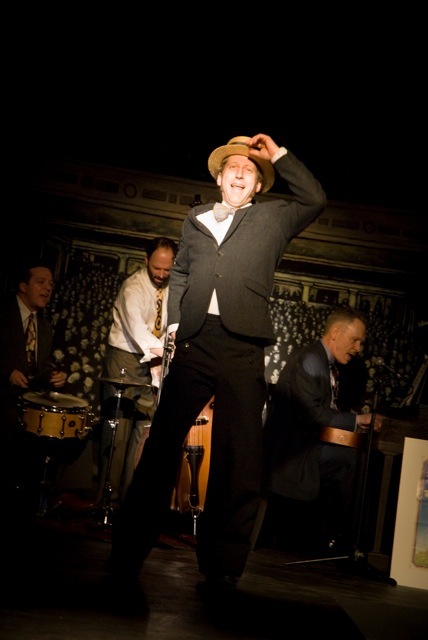 He'll also be spotlighting his other bands, swing DJ skills, and dance lessons to boot! The glorious MoonSpinners at the Georgetown Ballroom. Get ready to twist and shout! Meet husband and wife photo team Cory & LaRae Lobdell of Lifework Images seen here in a shot from their own spectacular Party Booth which will be one of the many highlights at our afternoon soiree. Be camera ready, you'll definitely get some great pics! 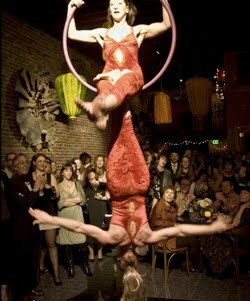 The marvelous Martha Enson of Enjoy Productions will be performing with her aerial troupe in acts of grace, beauty, charm and delight! Nonprofit organizers and event planners across the globe need to meet the phenomenal Kevin Joyce of Enjoy Productions. 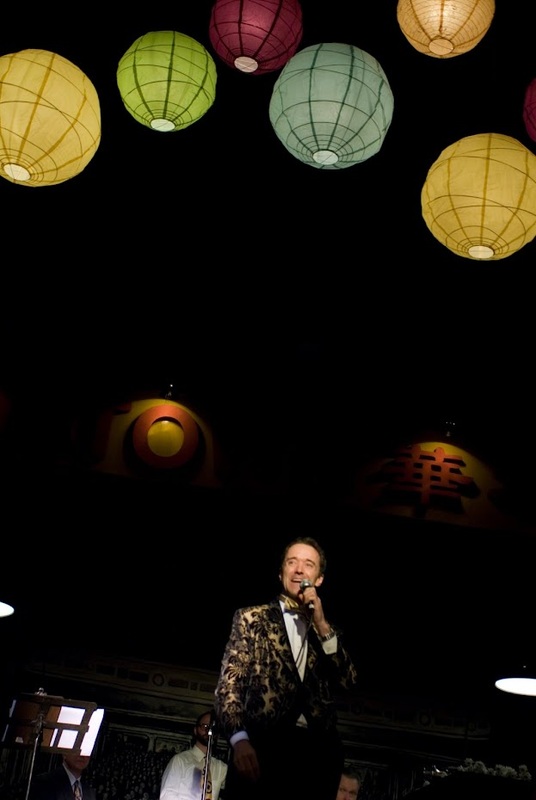 Not only is Kevin a skilled and dynamic auctioneer, gifted writer, performer, actor and singer, but an event creator and producer of fundraisers, theatrical shows and community events that enrich all with vibrance, innovation and panache! Kevin's been known to officiate heartfelt and joyous weddings to boot! Ladies & Gentlemen... The Blue 4 Trio! Just seeing the Blue 4 bust out a song is an amazing event in itself. 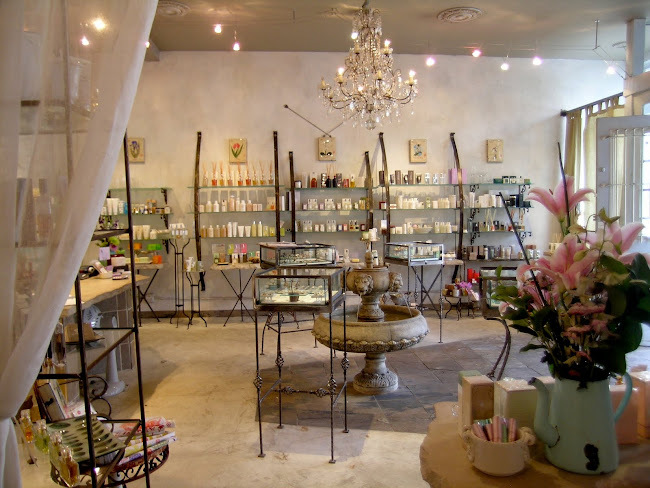 Essenza is a European inspired boutique that is a destination for unique and artistic wedding jewelry and scents in the heart of the Fremont neighborhood. They will be presenting the handcrafted jewelry of acclaimed designer Jamie Joseph's two-tone wedding ring collection and the extraordinary one of a kind wedding rings by the exquisite artisan Francesca Lacagnina at our open house of art and entertainment. 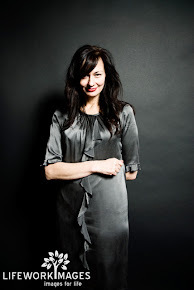 Francesca will be joining us for consultations at the event. Enjoy the master mixology of Hazlewood's finest. And there will be tango dancing like you've never seen! A fabulous fête of wedding greatness! Click on invite and go to blog for more info. I have been an exclusive, referral based wedding and event consultant for over a decade. This blog is dedicated to broadcasting the greatness of the amazing artists, alchemists and event mavens I'm so fortunate to work with and know! LUXE! 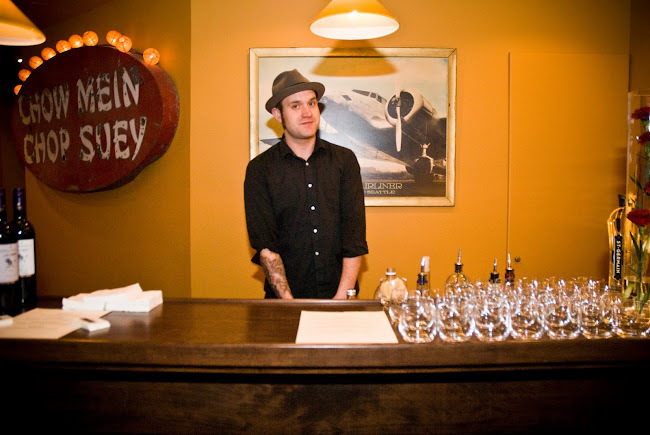 by Steve Viehman of One Shot Seattle Produced by Luxe! on Vimeo. The Twenty/Twenty Revue - Seattle WA Produced by Luxe! on Vimeo. Peruse the slideshow courtesy of the fabulous Lifework Images!